Add a dimension of dark desire to your style with the Miansai™ Screw Cuff Bracelet. Available in a variety of metals. 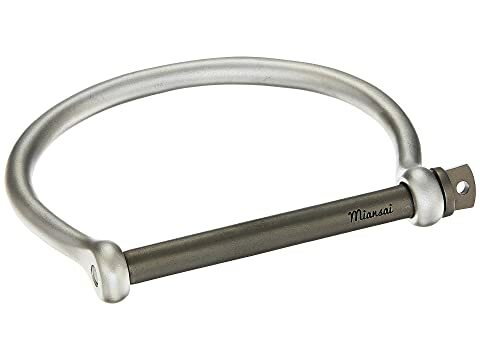 We can't currently find any similar items for the Screw Cuff by Miansai. Sorry! Love love love this bracelet. It’s gorgeous and I have received a ton of compliments in the one week I have had the bracelet! Overall: Rated: 1 stars! Comfort: Rated:2 stars! Style: Rated:3 stars! I feel like this is a knockoff. Or their quality has gone dramatically down. I have owned this same bracelet for several years and wear it several times a week. It's a staple in my wardrobe. Due to that the gold has rubbed down in several places so I wanted a new one. This one seems cheaply made, the material is definitely different. Its lighter and cheap feeling. It also arrived considerably scratched. This is going back.